Routine Flight Results in "Find"
CIVIL AIR PATROL FINDS MISSING AIRCRAFT IN CAPE FEAR RIVER NEAR HARNETT COUNTY AIRPORT - Raleigh, NC - The Air Force Rescue Coordination Center on Thursday, at 2:02 pm local time, alerted the North Carolina Wing of the Civil Air Patrol to assist in searching for a missing aircraft in the vicinity of Harnett County Airport. A CAP aircraft located the downed aircraft in the Cape Fear River near the Harnett County Airport at approximately 2:55 pm local time. The out-of-state aircraft, believed to have been bound for Harnett County Airport near Dunn, North Carolina, did not arrive at its destination and family reported the pilot overdue to the FAA. The North Carolina Wing, Civil Air Patrol, began marshalling aircraft assets to conduct an aerial search. Major Rob Mason, Fayettevile Composite Squadron, piloting a regularly scheduled CAP maintenance flight, in response to the search mission directive, was diverted from his assigned mission to fly to Raleigh-Durham Airport to pick up an aircrew for the search. At approximately 2:45 pm local time, while enroute to Raleigh-Durham Airport, Major Mason heard an electronic locater transmission (ELT) and immediately began homing in on the ELT beacon. 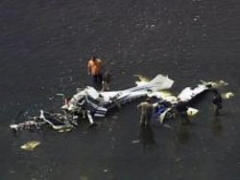 Major Mason subsequently observed the apparent aircraft wreckage in the Cape Fear River near the Harnett County Airport. Major Mason contacted Lt. Col. David Crawford, Incident Commander for the search, who then contacted Harnett County Emergency Management officials. The FAA was notified and Harnett County officials are securing the crash site at this time. Accordiung to local media reports, the aircraft was enroute from Philiadelphia, MS. Officials at the scene reported that there were no survivors and it is unknown at this writing how many persons were on board.